Pour a cup of soda. Drop in a pinch of salt. What happens? Try other things in fresh cups of soda – sand, sugar, marbles, coins, etc. What do you notice? The key to great nucleation a large surface area. Remember that surface area is how much space is exposed is on the outside of a substance. So, something like a marble is pretty smooth and solid, so there isn’t a whole lot of surface area exposed so not as much nucleation can occur. However, salt is made of very tiny, typically irregular grains, so there is a lot more surface area in salt so there is far more nucleation occurring. That’s the key to a Mentos soda geyser. The process of Mentos being made includes spraying sugar over the surface to create the hard shell. While the outside of a Mentos may look smooth, this process creates a VERY uneven surface at the microscale (see image below), allowing for a huge amount of nucleation to occur. 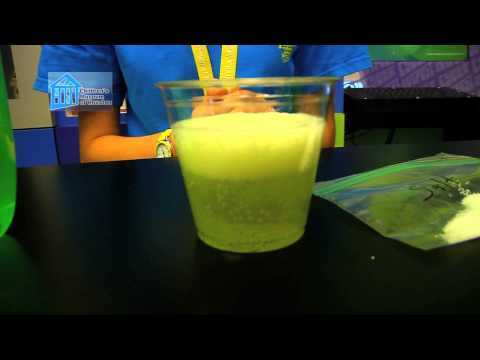 Test it by dropping a Mentos into a cup of soda and watch the nucleation!